If you are looking for a serious, high performance holster that will not break the bank, the Galco Cop Series is a great option. 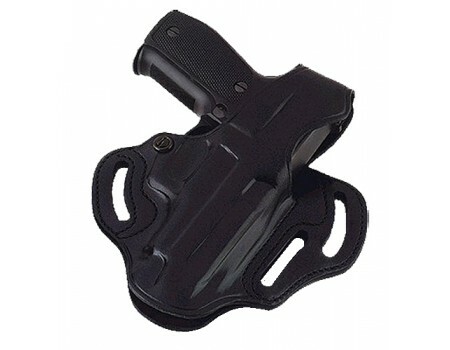 Galco's Cop 3 Slot holster is precision molded and allows comfortable carry in both strong side and crossdraw positions. A tension screw adjustment near the trigger guard facilitates maximum firearm retention, while the rear sight is protected by a wide safety strap and reinforced thumb break. The low cut design allows for easier, faster clearance of the firearm from the leather. The Cop 3 Slot is constructed of premium cowhide and fits belts up to 1.75".